Before you get into writing SQL Queries you should take some time to familiarise yourself with the application in which you'll be spending most of your time. This blog shows you the basics of SQL Server Management Studio. This blog is part of a complete SQL Server tutorial. Don't forget that Wise Owl also run excellent training courses in SQL in the real world! When you start creating queries you'll need to understand how to work with tabs. Each query window that you create will appear in a new tab at the top of the screen. 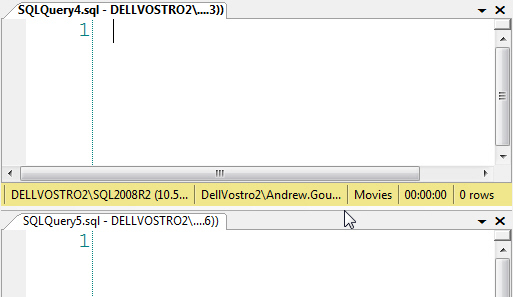 This screen contains two query windows, each in its own tab. The asterisk after the name of the leftmost tab indicates that it contains changes that have not been saved. You can create new query windows quickly by pressing CTRL + N on the keyboard. You can also click the New Query tool at the top left of the screen. The simplest way to switch between tabs is to click on the one you want to view. You can also click the drop arrow at the top right of the screen and choose a tab from the list that appears. Choose the option shown to close all of the open tabs apart from the one on which you right-clicked. If you want to close all of the open tabs, from the menu choose: Window > Close all Documents. Right-click on a tab and choose either of the two bottom options shown here. When you have selected one of the options shown above you'll end up with your query windows separated into different tab groups. You can click and drag on the dividing line between the tab groups to change the height or width of the groups. Choosing the option shown will send the tab into the bottom half of the screen to sit alongside the other tabs in that group. 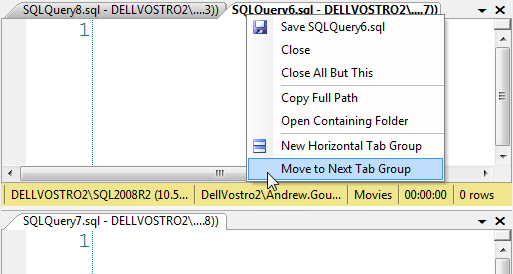 When you move the final tab out of a tab group that group will be removed.